Tabletop Classics Gold Square Acrylic Charger Plate with Round Center 12-1/4"
Home > Products > Tabletop Classics Gold Square Acrylic Charger Plate with Round Center 12-1/4"
Your specialty dish will take center-stage when presented on top of the Tabletop Classics Gold Square Acrylic Charger Plate with Round Center 12-1/4". 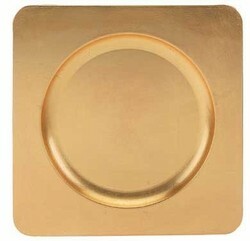 This rustic gold square charger plate adds a unique and lavish touch to upscale dining. Thanks to the square indentation in the center of the plate, this charger accommodates any size plate, or bowl. Exquisitely crafted from premium quality acrylic plastic, this lightweight charger plate is exceptionally tough and durable enough for repeated use. Dimensions: 12-1/4" x 12-1/4" x 12-1/4"